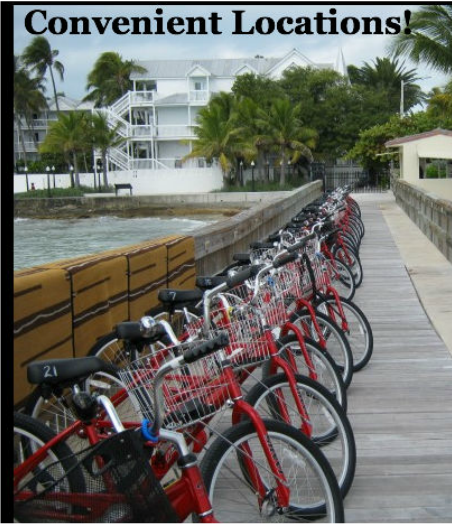 ﻿Our Services- ﻿ bike rental Key West at some of the finest resorts. 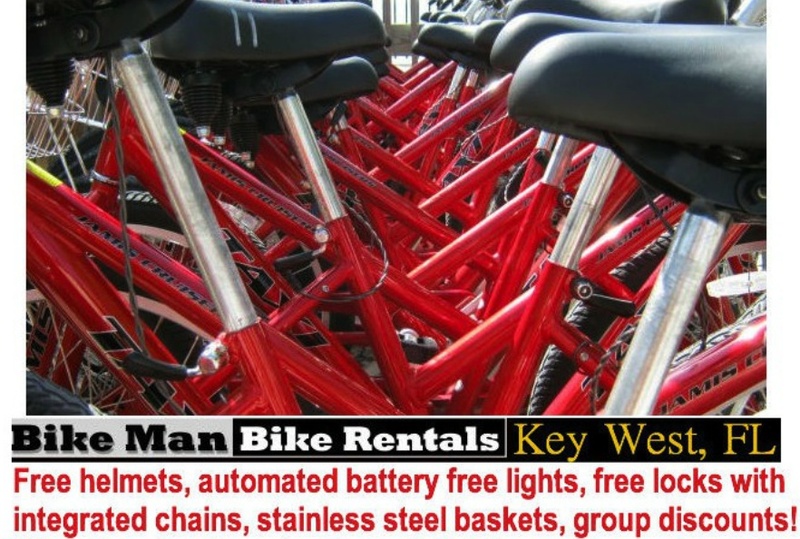 The best on the island, our Prices for bike rentals in Key West FL. Stop in at any of our locations or call and reserve, to get multiple day discounts and more! Pick van service available too. Scooters and electric cars for rent at our Sunshine locations as well. Biking in Key West couldn't be any easier! With our hundreds of bike rentals on the island, we maintain new bikes with innovative designs like aluminum handle bars which make our bikes weigh the least of all bike rentals in Key West. We have a large selection of tandem bicycles for rent, which are a lot of fun for two people! Try our hybrid speed bike, tricycles, and cruisers. You can rent children's bikes, and other bicycle rental options for families too, bikes with child seats, and trailers. Additionally we sell used bikes - call. The famous BIKEMAN T-shirts are on sale! Places to rent our cycles at, are all open to public. Call us today for your biking rentals, we also have tennis rackets for rent. We are the last island in the Florida keys that you can get to by car. But parking is limited and getting around Key West is much easier by bicycle! Get bikes at the Casa Marina Resort, at the Southernmost Hotel, The Reach, and next door at the Santa Maria Resort, Rent bikes at the Red Doors Gallery, Miami Subs on N. Roosevelt in new town, and two Sunshine Locations. The Bikeman Tom Theisen and his crew maintain a great fleet. All locations are open to everyone! Welcome. We are a very GREEN company and proud to be! Check out how we rent bikes in Key West Florida without using trucks, how we move our bicycles, and all tools and parts for maintenance. See this video "Bikes Key West " to watch transporting the gear and on the next video, meet the owner Tom Theisen as he explains the onsite bike station service at our different locations on the island for renting bikes. Other Services we recommend: Florida Keys Painting Contractors. From Key West to Key Largo, top quality work in the islands.